40 TVs. 33 Taps. Welcome to football season. Unless you enjoy spending Sundays alone, braying your displeasure at Matt Flynn (or whoever’s throwing interceptions for the Raiders these days), you’re going to be watching games in public very soon. We’ve got just the place. Give a hearty hello to 33 Taps, a multi-floored sports lair with 40 HDTVs and 33 delicious oat sodas, kicking off tonight. Located squarely in Hollywood – and one of the few LA sports joints that won’t be packed with Jäger-shooting Trojans – 33 Taps is pouring hoppy staples (Dos Equis, Bud, Sam Adams, etc.) alongside some harder-to-find treats (Is that you, Racer 5 IPA? Yes it is.). As for food: 33’s serving griddle-smashed burgers with grilled onions plus nachos lovingly slathered in queso. 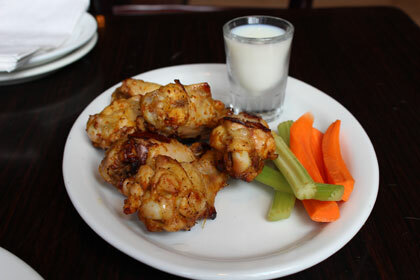 Wings-wise, get the 666 Diablo, succulent drumsticks so scorching they’re served with a shot of milk (be warned: the heat comes on slow). Big parties head for the Vine Room, an Edison-bulbed private bar in the back, with a 12-foot screen and its own entrance. Otherwise, grab a banquet to the left of the hostess stand. Get there early enough and you hold the remote.